A few months ago I came across the talented tapestry weaver, Maryanne Moodie. She’s given a surge to the wall hanging trend with bold colors, textures and shapes. She had commented on Instagram about how there’s such a “sameness” in some of the weaving trends, and how it would be nice to see different.. I commented how important it was for us as artists to be pushing ourselves forward so that in turn, we push others forward. In that conversation I suggested we introduce, use, and encourage others to use the hashtag #weaveweird on instagram when we post works we feel push the boundaries of creativity. 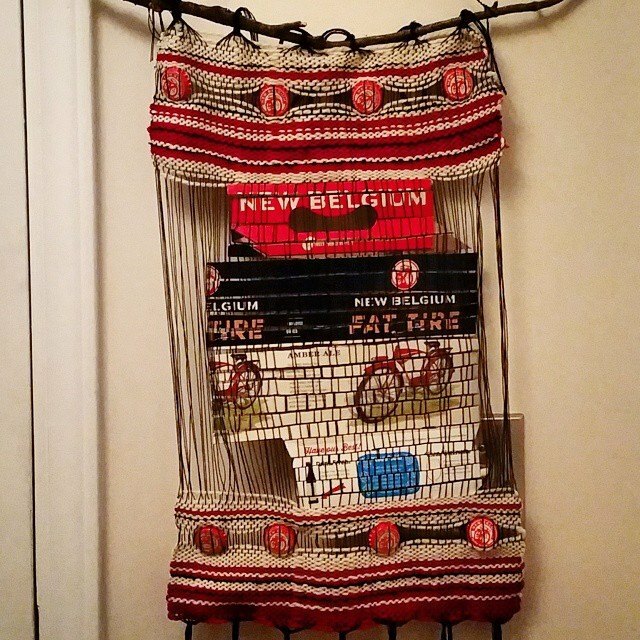 One of those random hits of inspiration came when I was visiting New Belgium Brewery in Fort Collins last month. 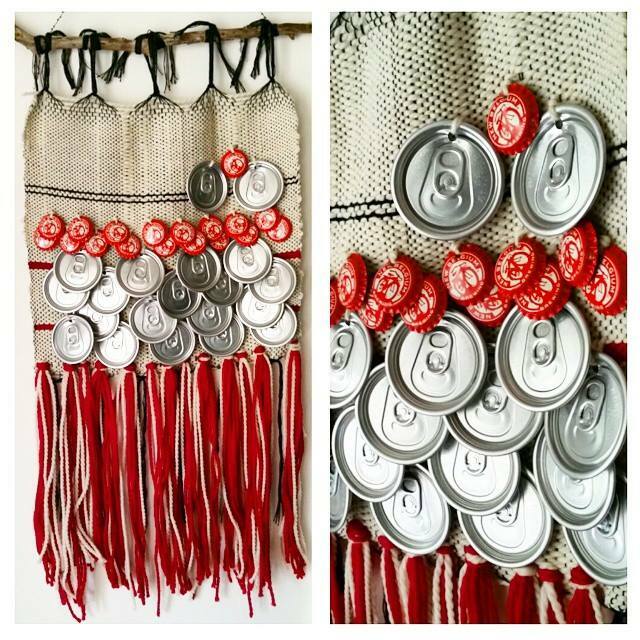 I imagined wallhangings using the empty six packs and cans, as well as the unpressed can tops and bottle caps. I thought about slicing the six pack into strips and weaving it back together so it reappeared.. I got home, with some supplies I had sweet talked from the brewery, and got to work on my loom. The first manifestation I played with negative space by weaving in the six pack and leaving the rest of the warp free. I also added the bottle caps into the weft, creating open space. The next manifestation played with texture and 3D elements. I used the bottlecaps and can tops like sequins and layered them into my weave. I wove around the six pack so the space was all filled. I also used empty cans and strung them from the fringes. This piece sounds like windchimes when it gets the slightest breeze. I’d like to do another version of this on wider warp and center the sixpack, so I weave on each side of it as well.. The final manifestation played on the windchime effect as well as the 3D elements from the last 2 hangings. I layered the bottle and can tops, and added some full fringe. It also sounds fantastic when you walk by. 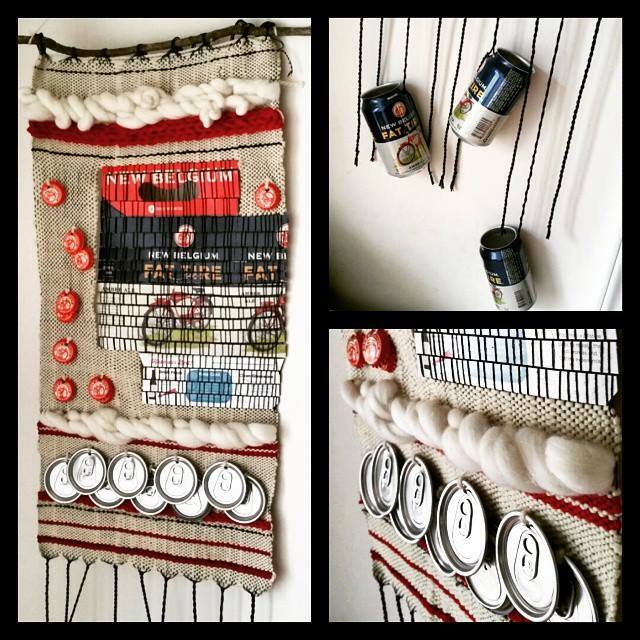 This final piece has fueled the desire to do a large version of the layered can tops. I’m going to have to sweet talk more supplies from the brewery. These wall hangings with experimental materials were a fun example of #weaveweird. As a SAORI weaver, I push myself and my students to explore the unusual within woven cloth. To embrace textures, encourage movement and try to keep present our intention within the moment during weaving. It’s ok to see what happens if.. It’s ok to push the boundaries and go beyond the edges. #weaveweird all the way!! ← Tools of the Trade- What’s in my Little Bag? You have a lovely creative mind. Gorgeous innovative pieces. Thanks Kathy!! Sorry I missed you this past weekend. When I was done teaching on Sat I needed to get home to meet my husband and I didn’t want to bother you loading out. Hope to see you soon!! Oh, you are so inspiring…I have been weaving with my hand spun yarn for fun and got hooked on yet another craft! My granddaughters love it too weaving on cardboard and making unique treasured weavings. You are so right about pushing boundaries, that is where the magic happens!